On 16 August 1940, the Stuka raid on Tangmere was one of the most serious yet to have struck England. This surgical strike against the station destroyed 13 aircraft and resulted in the tragic death of 10 RAF servicemen and three civilians. On top of this, almost all of the pre-war hangars, the station workshops, stores and the water pumping station were destroyed, with widespread damage in evidence across the station and vital services put out of action. Despite the attack, the airfield remained operational, and the servicemen and women at Tangmere rallied ensuring that the Luftwaffe did not escape the engagement unscathed. Indeed, the attacks were the catalyst for Churchill’s praise of “The Few” who guarded Britain’s skies, words widely reported as having been first spoken at 11 Group Headquarters at Uxbridge. The damage done to the station meant that an alternative location for the operations room (OR) had to be sought, namely one that was less vulnerable to attacks. The sense in shifting the operations room away from the RAF station itself lay in removing the OR from danger to ensure a continuity of command during attacks. Initially, the OR was moved to St James’s Infant School in Chichester. Extensive alterations were necessary; it had previously held 213 infants, who were relocated to St John’s School for the duration of the RAF’s occupation of the premises. Chichester had been relatively untroubled by Luftwaffe raids up to this point, and so the town served as a good base. Nevertheless, as the strategic realities of the war changed, the OR became a bottleneck in plans to give Tangmere ever-greater responsibilities. Top-level discussions about the reorganisation of sectors within Fighter Command were placing an increased emphasis on 11 Group, of which Tangmere was part. Tangmere was a sector control station within 11 Group, covering the area south of Uxbridge and down to the Channel. Biggin Hill and North Weald sectors lay to the east, while in 10 Group to the west the closest sector was Middle Wallop. These sectors formed the organisational framework of Britain’s air war, guarding the skies over Britain’s south coast. Minutes from Air Ministry meetings detail the changes which took place over the winter of 1942, as the tenor of the war changed and the leadership of the RAF went through significant evolutions. Sir Trafford Leigh-Mallory, who had been head of 11 Group, was promoted to Air Marshal in November 1942, replacing Sholto Douglas. Leigh-Mallory’s preference for unified command chains saw him lead a campaign for Allied cooperation, but also a pronounced restructuring within Britain itself. As part of this reorganisation in 1943, the boundaries of Tangmere’s sector were enlarged. This was so pronounced that it was actually merged with the Northolt Sector (in 11 Group), which lay immediately to the north. Tangmere subsumed Northolt’s control area for Fighter Command. Other sectors being merged were all in possession of “large specially and recently designed operations rooms with the exception of North Weald, Biggin Hill and Tangmere.” Extensions to the existing facilities at Biggin Hill and North Weald were judged to be sufficient, yet for “Tangmere (combining Northolt) a complete new operations room would be required and the suggestion is that the site for this should be well inland.” The old operations room at St James’s School was now not sufficient, though its location at Chichester remained acceptable. A new site for the operations room had to be found. Two options were presented for the new site: Bishop Otter College in Chichester, West Sussex, and Southey Hall in Great Bookham, Surrey. Great Bookham was home to the 4th Canadian Artillery Regiment (many of whom were French Canadian), stationed at a requisitioned boys’ preparatory school called Southey Hall. Much like Blake Hall, the stately home which served as operations room for North Weald, and Bishop Otter College, Southey Hall represented a good-sized, secure building to be converted for use as an operations room. Initially, the preferred option was to build the operations room at Great Bookham, where a new block would be on a main cable route, ensuring increased security by reducing the length of communications. However, the cost of this new block was increased by the need to take on extra labour. Initial enquiries to the 1st Canadian Army had unfortunately failed to secure a much cheaper labour commitment from the Québeçois! One of the greatest problems informing the decision was an Air Ministry-imposed limit of £5,000 on the amount to be spent at any one station on any building work required in connection with the amalgamation scheme, through which the sectors had been reorganised. As Leigh-Mallory’s memo shows, there was increased pressure for a new OR, since within the revamped sectors Tangmere’s responsibilities had been expanded. Tangmere Sector was responsible for seven airfields (Tangmere, Ford, Northolt, Heston, Westhampnett, Merston and Shoreham), four Ground-Contolled Interception (GCI) stations (Durrington, East Hill, Blackgang and Ventnor) as well as two brigades of searchlights and offensive operations. The sector was to be commanded by a group captain, namely Group Captain William “Paddy” Crisham (born and raised in Ireland, hence his nickname) from 30 April 1943. Crisham became one of the enduring characters of Tangmere’s history and would eventually become an AVM in 1953. As part of the amalgamation of sectors, suggestions were made to rename the new Tangmere-plus-Northolt sector “Pompey”, “Sussex”, or “South Downs”. None of these suggestions was taken up, and the sector kept the name of Tangmere to avoid the confusion of retitling. This, however, seemed to characterise the ponderously slow pace relating to the 11 Group sector amalgamations; the difficulties which had delayed the development of new ORs were not overcome quickly and there appears to have been little in the way of consensus. As of 16 April 1943, the decision to amalgamate the sectors was suspended indefinitely, pending decisions on the location of the new operations room for Tangmere, proving once more the vital role the OR played. Once the decision was made, Leigh-Mallory was actively involved in strategic discussions with the Operational Planning Committee, pushing for a greater role for Fighter Command. Bombing operations in 1943 were reported to have drawn out the Luftwaffe’s day and night fighter reserves, calling for a revision of strategy to support the bombing. Strategy meetings had identified an important role for 11 Group, ensuring any offensive operations would be coordinated with them before orders were issued. Likewise, any combined operations with American forces in which fighters were to be involved would be directed from 11 Group headquarters at Uxbridge. These decisions placed 11 Group at the centre of any projected combined offensive operations, such as Operation Overlord. This central positioning hastened the upgrading of 11 Group’s resources in anticipation of increased expectations and strains on their operational efficiency. These increased sectors allowed for greater ease of coordination, which would prove increasingly useful as command became increasingly centralised in the build-up to an invasion of Europe. Fighter Command was reorganised by the end of 1943, when it was replaced by the Second Tactical Air Force (2TAF) and Air Defence Great Britain (ADGB). Squadrons continued to be controlled by 11 Group, however, and the number of squadrons under the Group’s control increased from 33 to 57. 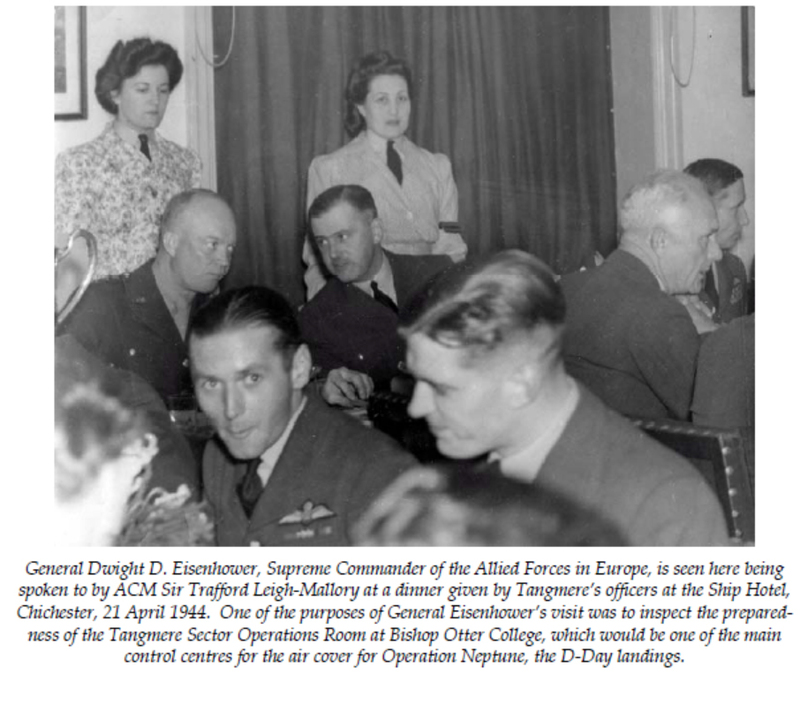 Tangmere was to play an important role in both these organisations, as a crucial fighter station for responding to enemy action and also as a strategically important sector operations room for coordinating offensive action under the auspices of 2TAF. Sector reorganisation was complete by the spring of 1944. Debden was taken over by the USAAF; Hornchurch, Kenley, and Northolt were absorbed in the three enlarged sectors: North Weald, Biggin Hill, and Tangmere, respectively. 2TAF was focussed on the attainment of air superiority in support of planned offensive action over the Channel, in particular the developing plans for invasion. This role would be complemented with air support for the invading forces and an evolving role as the invasion advanced. The new command structure would be tested in a series of exercises to ensure that it could function efficiently and modify its structure as circumstances dictated. The newly inaugurated OR for Tangmere was complete in time for this series of operations designed to gear up towards Overlord and would also see its role tested alongside that of the command structure. Leigh-Mallory recognised the importance of this airfield, actively campaigning for a new operations room. When he was able to secure this, Tangmere became a central hub in 11 Group and its importance in 1944 was profound. This post originally appeared in The Tangmere Logbook (Autumn 2016), pp.25-28. The image (which originally accompanied another article that I published, ‘Tangmere and Operation Neptune’) is also from the The Tangmere Logbook (Summer 2014), p.25. The research was undertaken with funding from an Innovation Award granted by the University of Chichester, to help enliven and develop the exhibits at the Tangmere Military Aviation Museum.